I took this photo of Women Hunters the other day. The gorgeous painting, an original by Zimbabwean artist Obed Muringani, has been the central work on our living room wall for many years. Back when I was a graduate student, Obed and his family lived in the same student housing complex as I did at the University of California, Santa Barbara. He was a visiting artist at the university in 2004. Obed and his wife were also raising their young family at the time, and I remember watching him paint outdoors, his family often with him. Little did I know at the time was how important the painting would become to me five years later. At 4.5′ x 5.5′, the painting is quite large. The work was an integral part of my daily visual experience during both of my pregnancies, and I focused on it also at various points during my labors in 2009 and 2011. 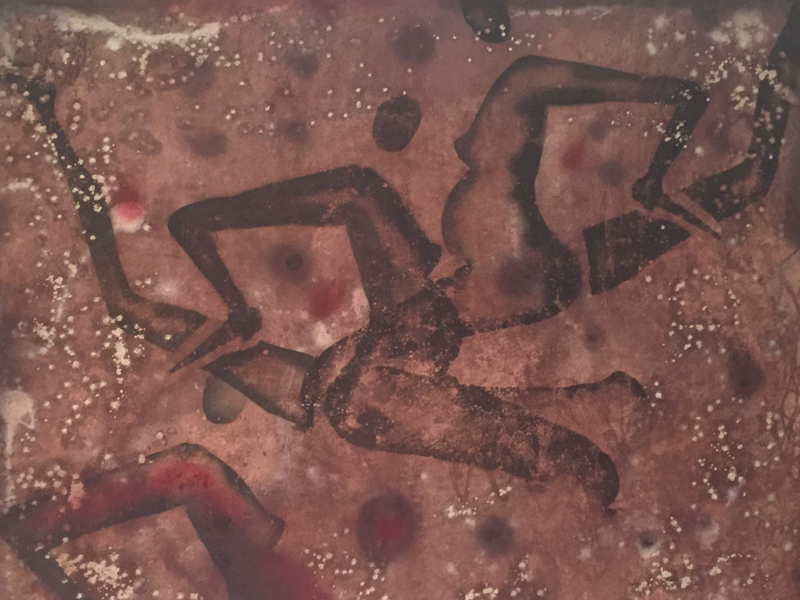 Obed’s work is stylistically unique and often incorporates themes found in prehistoric paintings of the Kalahari Desert Saan People’s ancestors, also known as Bushmen or Basarwa. The warm brown tones of Obed’s Women Hunters and the dynamism of the two central figures of the painting exude a sense of calm energy. When I was pregnant, I would look at this painting every day and it brought me strength, while also reminding me that women across time, history, and culture, have been pregnant and given birth. For more information about Obed Muringani or to purchase prints of his work, see his art page here or visit his Facebook page.